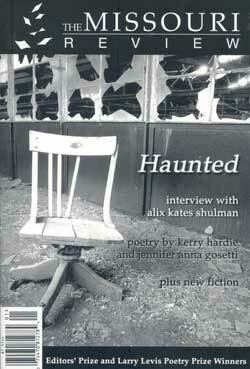 The Missouri Review » 24.1 (Spring 2001): "Haunted"
We are nothing alike. If my mother had had a coffee-colored baby with nappy hair after she went off with Clay Dixon, that child would look more like her than I do. Now, of course, she has the sagging cheeks, the giving-way at the jaw line. At the airport, any of the old women getting off the plane could have convinced me they were her. “The first step he took was his first step toward the penitentiary,” Pam liked to joke about her son, Avery, during the year that she and Avery lived next door to me in Sea Coast Villiage, which sounds like a prettier place than it was. It was a strip of poverty down in the Florida Panhandle near the ocean, shortly before that part of the coastline was developed. That there lived a man named Israel Schelde, there can be no dispute. There is the reflex hammer with the reddish rubber tomahawk head bearing his initials. There is the re shirt, thick and coarse like Indian just, with black buttons, that Israel was known to wear as a coat and in which he appears in many photographs. And in many other places there are many other things, and many people will give accounts of him. Our father always called my mother Bean. She was slender and crisp. Now her cheeks sank in darkened hollows. Her nose was a pointy beak. I found her on the front porch, looking off toward the mountain. She flinched when I came up on her; then her arms trembled and one leg quivered in a little burst as if she had a chill. Lately Lisa’s mother had been telling her things she does not want to know. Lisa’s mother, who has told her little, now will not shut up. She follows Lisa to the car, under starlight, to tell her that Lisa’s father has been impotent for years. The enthusiasts had planned to hold their Eight Annual Dinner Dance at the house of Mr. and Mrs. Hugh Kamilelaa, but the Kamilelaas were divorced in March, and Mrs. K., who kept the house, refused to host a party to which her husband would have to be invited. It will sound dead on like an infomercial when I confess the truth. That is because at the beginning — no, for ten years before the real start, when I actually dwindled — the cable hucksters spoke to me at all hours in their baby lisps and daddy nostrums and lover landishments until the world split into food and joy and I chose joy. Mercedes had been to two other Ers before showing up at Bellevue three weeks ago. I’d only been doing sick call that day because one of the other residents had twisted his knee playing volleyball. She was a classic aseptic meningitis, the kind that you’d sent home with asprin and some chicken soup, but the ER had decided to admit her to the hospital.